A new kind of love affair is being carried on openly everywhere you look these days. It appears that sitting on a park bench, holding hands and gazing deeply into your beloved’s eyes, is becoming passé. “Reach out and touch someone,” the old Bell System slogan, has taken on a whole new meaning, as our eyes and ears are glued to our hand-held smart phones, iPods, and iPads. Our magnetic attraction to these devices can be seen in every public setting: offices, stores and restaurants, theatres and concerts, places of worship and funerals. We’re connected while walking and crossing the street, and still (in spite of the recent Maryland law) while driving. With today’s amazing tools for finding and exchanging information, where we direct our attention and the ways we communicate are rapidly changing. Look around at any lecture, workshop or conference. At any given moment during a speaker’s presentation, about half of the people are using their devices, and it’s not to conduct urgent business (although a few of them may be taking notes on the presentation). Because most of them have their devices out in plain view (remember when people were more discreet and put them in their laps? ), it’s easy to see what they’re doing – texting, checking and answering emails, showing each other photos of cute children or recent vacations, playing games. Let me say up front that I am not a Millennial, but I am also not here to slam the younger generation. On the contrary, like many others in mid-life, I know that the best resource to consult for help with a problem with my phone or computer is a handy teenager. And I check my emails more times a day than I’d like to admit. What I’m talking about is attention. I was raised to listen respectfully when someone is speaking or giving a formal presentation, and to look someone in the eye during a personal conversation. I also have a hard time doing two things at once. No way could I be writing this blog and talking on the phone at the same time. This fast-moving cultural shift is fascinating. Our romance with handheld devices crosses all generations. Grandparents, Boomers, and kids are equally enamored with them and can’t resist consulting them almost constantly in any setting, without the slightest embarrassment or apology. And no one objects. Everyone seems to have accepted the fact that any conversation can be interrupted. Is it that “manners” as we once knew and used them are becoming irrelevant, and even obsolete? Perhaps the human brain is undergoing actual changes, and people are just thinking differently because communication today is so speeded up. Can we really pay equal attention to many activities at once? What I’ve been observing is not “multi-tasking,” a skill most of us have had to learn because we play so many different roles in life simultaneously; we are employees or bosses, parents, caregivers, partners. No, this is different. 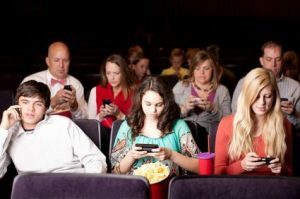 People are deliberately tuning out and turning their attention elsewhere. Remember when your teacher would say, “Children, please give me your undivided attention”? It seems we are losing the skill of concentrating completely on what someone else is saying. If a public speaker doesn’t grab us immediately, we lose interest. And it’s contagious. One person’s inattention distracts others around him, so it becomes harder to pay attention to the speaker, even if you wanted to. Try focusing on what a presenter is saying when the fingernails of the person next to you are tapping out text messages. Speakers are aware that they are competing for their audience’s attention. Must they resort to gimmicks and antics, shouting or shocking? Do you have to be a razzle dazzle performer to be heard? Some speakers today are taking the “If you can’t beat ’em, join ’em” approach, enlisting technology to involve their audiences, for example, by inviting them to tweet during the presentation. Where is it all leading? Think about this: What if your therapist interrupted your session to answer a call or text message? What if your rabbi stopped his or her sermon, or your teacher interrupted the class with “Sorry, I have to take this call”? What do you do when you have something really important to discuss with your teenager or your spouse, and you feel like you are competing with other people who are not physically there, but who all want to be answered right NOW? What if you really need to talk to a friend and you simply can’t get through? Ask any marriage counselor, and you will hear that one of the most frequent complaints from couples is: “He/she isn’t listening to me.” How does it feel when you are the one who wants to be heard, and you are not getting someone’s undivided attention? We can’t swim upstream. Yes, cultural expectations, behavior and norms are changing. Before we let ourselves drift with the current, it would be worthwhile giving some thought to what kinds of attention and communication we value and with whom, and how we can hold on to that. For some tips on “Unplugging from Technology,” click here.